Check out this simple thanksgiving dressing recipe and find out what the debate is all about. 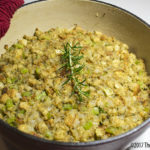 Is it Thanksgiving stuffing or Thanksgiving dressing? The two terms are often used interchangeably, however, there is a slight difference in how they are cooked. A simple Thanksgiving dressing recipe can also be used for stuffing the bird. What is the difference? Dressing is a term used to describe a delicious holiday bread casserole treat that is a favorite among many. While both are used interchangeably, there is one major difference between the two. Th difference lies in how they are cooked. The dressing is a casserole like bread dish that is typically served up with Turkey as a side. The dish typically consists of day-old bread crumbs or chunks of bread, celery, onions, moistened with broth and held together with a couple of eggs. It is then baked off until the top is crunchy and center is moist and tender. 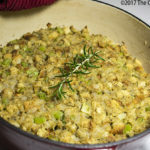 Stuffing is used to describe the dressing that is “stuffed” in the cavity of the Turkey or other bird (works with other meats too) and baked inside while the bird roasts. The idea is that the juices from the meat get soaked up in the stuffed dressing and add more flavor. This is not just in theory, you can taste the difference between stuffing and dressing. My mother always made both, because the stuffing never lasted long in our house. While the dressing wasn’t quite as good as the stuffing, it was still one of our favorite dishes on the Thanksgiving table. Use a good quality chicken broth or better yet, make it from scratch. Thanksgiving dressing or stuffing sure as heck can be made ahead of time. Just mix together the ingredients and store in the refrigerator for up to three days. 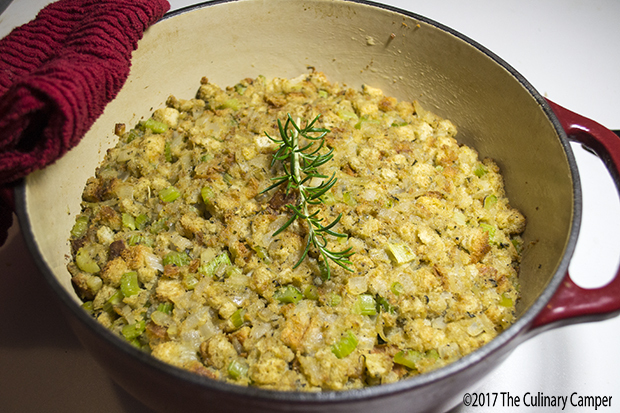 If you plan to make the stuffing in the bird or in a Dutch oven, store it in a different container. When you are ready to bake it, take it out and place it in the baking dish or stuff it in the turkey. Super simple! Celery and onion are key ingredients of this simple Thanksgiving dressing recipe. Most dressing recipes are pretty easy. Just cook the celery, mix the ingredients, toss it in an oven safe dish and bake. You do not have to worry about how hot the dressing gets since it is not touching any part of the raw bird. However, if you plan to make stuffing (stuff the dressing into the bird) you need to be aware that since the dressing is touching the raw bird, it should be cooked thoroughly. The minimum temperature should be 165° F. for both the thickest part of the thigh as well as the stuffing. Some recipes may put this temperature a bit higher, but the minimum for any poultry is 165° F.
Celery and onion sauteed in butter. The answer to this question is pretty simple, pretty much any type of dried bread or day-old bread works great with this recipe. A favorite bread type of mine is sourdough, but I also think dill rye is an amazing bread to use for stuffing. For simplicity, this recipe uses a bag of premade stuffing croutons, but you can replace that with anything you like. Dutch oven filled with Thanksgiving dressing. Mom used to freeze the Thanksgiving dressing leftovers all the time (if there were any. LOL). Usually, there were leftovers because mom always loved them and wanted the dressing when she had those delicious leftovers. Because of this, she would make far too much stuffing. We never complained. In fact, it was, and still is, my favorite leftover. Just make sure there is some leftover gravy to go on it. Not only did mom freeze the dressing but the mashed potatoes, gravy, and turkey also froze well. Dutch oven with Thanksgiving dressing. While you can probably use your grill to bake this simple Thanksgiving dressing recipe, my preference would be to use a Dutch oven and use coals on top and on the bottom. This will assure even cooking and keep any chances of burning to a minimum. I often use my old Weber Grill as a Dutch oven table. It is not fancy but it does the job and is big enough to hold my large outdoor Dutch oven. Refer to my Dutch oven coal chart to determine how many coals you will need and cook the dressing for the same amount of time at the same temperature. The great thing about cooking the dressing outside is that you can free up the oven for other dishes like the turkey, dinner rolls or anything that a guest might bring that needs baking or warmed up. Also, you will impress your guests with your outdoor knowledge and skills. Parsely, sage, rosemary, and thyme make this simple Thanksgiving dressing recipe its fantastic flavor. Take a paper towel and grease a baking pan or Dutch oven with some butter. Set aside. 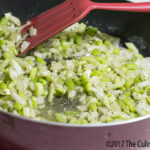 Melt butter in a large skillet, add chopped celery, onion and spices and cook until onions are just translucent about 5 minutes. Cook longer if desired, less time will result in crunchy vegetables which may or may not be desired. Remove the mixture from the heat and add the stuffing breadcrumbs, broth and eggs and lightly stir the mixture in the skillet. Once the stuffing is mixed, transfer to a baking dish or Dutch oven. Bake at 375 for 20 to 30 minutes. Alternatively, add some of the dressing to the cavity of the bird. Bake inside the bird until both the bird and the stuffing reach an internal temperature of at least 165 degrees Fahrenheit.